Instead of immediately apologising to Moscow for the Turkish Air Force downing the Russian SU-24 being part of the Russian Air Force group from the Hmeymim base, whose war with IS terrorists and other terrorist groups on Syrian territory is not just empty words, but real action, Ankara was quick to come out with offensive attacks against Russia. And for some reason, it then went on to demand that the NATO Council convene, although not only wasn’t Turkey attacked, but rather itself committed an act of aggression. It is impossible to differently interpret the attack on the plane of the anti-terrorist coalition performing the mission to destroy terrorist locations in Syria. Moreover, the Turkish F-16 did it when the SU-24 was in Syrian airspace. What is all this: stupidity, a mistake, or something else entirely? If we disregard the version that it was provocation planned by the US or Qatar, or Saudi Arabia (the cancellation of the Saudi king’s visit to Moscow on November 24 three days before it was set to take place seems rather strange) with the help of the Turkish military, then it is quite clear: this kind of aggression is dictated by the nature of the current Turkish state headed by Islamist Erdogan, who considered himself the Sultan and decided to create a neo-Ottoman Empire in the Middle East, even relying on all sort of unsavoury groups such as ISIS, Jabhat al-Nusra, Jabhat al-Fath, etc. Historically, modern Turkey has always been prone to aggression and ill-considered decisions. Let’s not forget the Armenian genocide, where the Turks massacred millions of entirely innocent civilians, be they Armenians, Greeks or representatives of other Christian nations. From 1941, Ankara was waiting for an opportunity to attack the USSR on Hitler’s side, but was thwarted by the Soviet victory in the Battle of Stalingrad. Then Turkey joined NATO and conducted a hostile policy against Moscow. In 1974 Turkish troops invaded Cyprus, which led to division of the state into two parts. All Greeks were deported from the Turkish side of the island. And even more recently, Ankara has demonstrated its hostility to the Russian Federation by supporting Ukraine on the Crimea issue, even though it was Moscow that gave the Crimean Tatars, whom Turkey give preferential treatment to, the most extensive rights and representation in the government, the ability to study and communicate in their native language even in the government. There’s no point in even mentioning Ankara’s behaviour during the separatist rebellion in Chechnya – there’s too much blood on the hands of the Turkish special services. Even now, the remaining Chechen bandits are living peacefully in Istanbul funded by the Turkish Treasury. Now Russia will be able to better understand why a lot of European countries have opposed Ankara joining the EU for decades. Its manners and customs are too wild, quite alien to European culture, especially after Islamist Erdogan came to power. It has a complete lack of respect for human rights: the genocide of the Kurdish population and the disregard for other countries and peoples are typical for Turkey. Indeed, apart from the Kurds, the Alawis of İskenderun and the Alevis living in Istanbul are also oppressed. Turkey’s accession to the EU would be like throwing a cat among the pigeons. Moreover, Erdogan managed to ruin relations with all his Islamic neighbours: Iran, Iraq and Syria, and most recently incited civil war in the hope of annexing the territory of the northern part of Syria, which is densely populated by Turkmen, i.e. Turkic-speaking descendants of the Ottoman Empire. Although after the World War I with the acquiescence of Britain and France, Turkey has grabbed the immense territory of the Sanjak of Alexandretta, which is now called the Hatay Province (neighbouring the Latakia Governorate), where the population is exclusively Arab. Even if we assume, although the facts tell a different story, that the Russian Su-24 flew for a few seconds into Turkey’s airspace, is that reason to shoot down the plane of the country with which you want to build a partnership in all spheres, including in the fight against the ISIS? 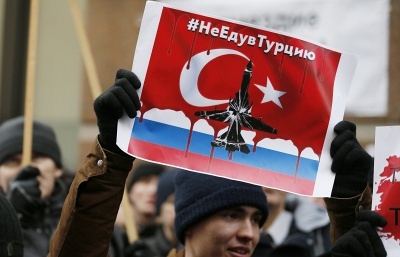 After all, the Russian aircraft did not pose any threat to Turkey. It was engaged in carrying out strikes on the locations of militants of terrorist groups. All the more so because Ankara itself demonstrates perhaps the most striking example of how to invade sovereign states, whether from the air, from the ground or simply by carrying out artillery strikes on their territory. Let’s remember, Iraq under Saddam from 1991 to 2003, when Turkish troops regularly “visited” northern Iraq, sometimes 40km into the country, with tanks and artillery, under the pretext of fighting against the PKK. Turkey did not coordinate with Baghdad or local Kurdish leadership. But the Turkish Air Force bombed these Iraqi regions, killing Iraqi civilians, women, children and the elderly alongside members of the PKK. And now Turkish aircraft casually fly in Syrian airspace without the consent of Damascus under the pretext of participating in the anti-ISIS coalition led by the United States, carrying out air strikes on not only terrorist locations, but also on Syrian Kurds, and occasionally the Syrian army. And no one bats an eyelid. The entire global community. Acknowledging the absurdity and danger of the consequences of Ankara’s act of aggression, on the evening of November 24, even a Pentagon spokesman de facto denied any American involvement in the Turkish Air Force downing the Russian plane, stressing that the US does not have anything to do with Turkey’s behaviour as it was not acting as part of the coalition but independently to protect their airspace. – Protection from whom? From a participant in the operations against the ISIS, from the smuggling of oil thanks to which Erdogan’s friends reap huge illegal profits from selling it via the Turkish oil terminal of Ceyhan? Washington’s logic does not warrant questioning. But then, Russia will automatically be entitled to act according to Article 51 of the UN Charter, seeing as an act of aggression was committed against it. And it has been committed, according to President Putin, by “an accomplice of terrorism.” The reaction of Moscow can and should be equally tough and corresponding. First, if after the incident with the Su-24, the Turkish Air Force invade Syrian airspace, the Russian Air Force have the right to shoot them down, whether by means of anti-aircraft defence, or by its military aircraft. After all, Russia has not formalised an agreement on the prevention of air incidents with Turkey or the US and the Pentagon spokesman confirmed on November 24 that the case of the SU-24 was not covered by it. That means, the opposite is true. All the more so as Syria has invited the Russian Air Force to help in its fight against terrorism. Turkish aircraft were not invited, and they may well perform the task of covering the oil smuggling routes from the ISIS territory, thus facilitating the financing of terrorism, which is contrary to the UN Security Council resolution. Furthermore, the invasion of Syrian airspace by Turkish aircraft poses a threat to our air operations to combat the ISIS and other terrorist groups. Second, if the Turkmen tribes fighting against the Syrian army – Russia’s land ally – who took the bodies of our pilots do not return them, the Russian Air Force has the right to launch an attack on their location as allies of terrorists. Mercy cannot be shown here. Third, it is necessary to completely destroy all oil and oil product smuggling routes from the ISIS territory to Turkey in order to deprive the terrorists of their sources of funding, and capture the Turkish nationals engaged in illegal operations with Syrian oil and bring them to a tribunal as the criminal accomplices of terrorists. It is particularly important to bomb the entire oil smuggling route in the border area with Turkey, be it roads, bridges, or anything else. Fourth, it is necessary to provide maximum assistance to the Syrian Kurds in their struggle against the ISIS and other terrorist groups, given that Ankara is not letting them to engage in a fully-fledged attack on Raqqa, the ISIS “capital”. In general, it is necessary to urgently raise the issue of the Turkish Kurds’ right to autonomy and other political and human rights at the United Nations. After all, the Kurds of Iraq and Syria have an autonomous government that guarantees their rights as a minority. It’s high time that the Turkish Kurds were provided with the same. Additionally, the time has come to remind the United Nations of the right of nations to self-determination. Kurds make up a third of the Turkish population. This even gives them the right to establish their own state. After all, this has already been granted to several thousand residents of the Kingdom of Tonga in Oceania so why is Turkey depriving 20 million people of their historic territory? The Ottoman Empire ceased to exist 100 years ago. Fifth, it is vital that any cooperation between Russia and Turkey be discontinued, including tourism, any air services, business communications, the construction of nuclear power plants on Russian loans, all gas projects must be stopped, and simultaneously halt the supply to Turkey. What they have done today is a heinous crime for which Ankara must pay in full.